Eipix Entertainment proudly presents the newest addition to the Phantasmat series! Phantasmat: Insidious Dreams is rated 3.5 out of 5 by 11. Rated 5 out of 5 by CourageAngel from Childhood Trauma and Revenge The game opens with a flashback. There's a group of children outside, and one ends up injured. There's the question of, "Is he dead?" And then we jump forward several years, and the kids are adults. You play as Ashley, and you are on your way home. You're driving, listening to the radio, which is warning you about a bad storm that will occur soon. As they're mentioning this, you get hit by another car (it hits the driver's side). You later wake up in the hospital to your husband and the doctor discussing what to do, and that you need to take it easy while you recover from the crash and the amnesia. The husband, Stan, decides that you should go to his family's farmhouse. And so off you go, and into the mystery and haunting. As games in this series go, I really enjoyed it. It has the obvious tragedy and spirits haunting the people/place. The story is a nice change. I like that we had to escape from a mad man while trying to discover who we are/our past. Over the course of our investigation/run for our life, we discover more clues about the motive. I will say that I was startled a few times, and I was telling the character, "I hope you locked the door!" Yeah, she didn't. And it's always amusing to see how fast a cell phone charges in games... I was wishing mine charged that fast! The story ends with a "hey, we're still alive!" and "the spirits are freed!" The other "bad" in the game vanishes, so I wonder if it returns in the CE. The visuals and sound were lovely, and I had a lot of fun playing this game. I really enjoyed the story, and the level of challenge was great. The atmosphere of the game had a good level of spooky. I was waiting for the bad guy to pop up several times, and was still surprised when they did. If you're a fan of this series, or this genre of game, I recommend this game. Try the demo and see what you think! Rated 5 out of 5 by kerith90angel from Based on completed game I thought the intro cut scene to this game was just amazing, as you look up into the trees crossing over head. Wow! I actually purchased the CE on sale and I’m glad I bought the longer version. The task list has a handy counter that keeps track of the percentage of the game you’ve completed; just so you’re aware it’s there. This is a quality game that became better for me after the demo. Live actors are portrayed as ghosts and they are just off the hook—It is so refreshing to see characters in a game that don’t move in gliding or clunky ways. It feels like Eipix spent time and money to perfect them and it works! For this reason alone, the CE was worth it for me, along with bonus play. This game was larger on quality than quantity I thought, and I’m ok with a shorter game if the time to create it is quality. The SE portion of the game took me 3 hrs. 2 min. I play on custom- average rate of play and try to figure out most things but I skip the mini games I get frustrated with. I play all the HOPs & not alt/match 3. At one point in the demo, when you glance in a window pane & see your character's image reflected, it was perfect! It made me connect to the character and the story more. Pay attention to the water in this game, it looks so real; especially in the “Orchard” in chapter 2. The voice actor for our baddy gets an A++ from me & consistently gave me the creeps throughout the game. I also love when a story taps into the astral plane,OOB exp. & lucid dreaming. This game really nailed that feeling and even the pick up notes where interesting-- on the subject. In general I love the storylines in the Phantasmat series. I feel like this series always tries give you a spooky story that keeps you guessing. The main game works you up to a great ending and it’s independent from the CE. I loved the ending of the main game. Chapter 1 pg. 3 wtg-HOS #2 was a blast. In the Children's room. It has several steps + one point it has my favorite type of HOS play, which is placing items BACK into the scene and you even get to use UV goggles at one point. This same area also has a really fun pin ball machine MG. Chapter 2 has a MG that is set up like a 80s console video game where you must avoid obstacles with your little car. This one was so fun and had me on my toes in the fastest setting. Chapter 4 has a maze game, over several scenes, where you feel like you are actually walking through the corn yourself. RE: CUT SCENES & JOURNAL- This game DOES NOT HAVE a journal that holds notes or articles. I feel these are needed because it usually takes me several days to complete a game so I like to brush up on the story upon restarting every so often. It’s obvious a lot of work goes into the cut scenes (and storybook sequences) and it would be so great to have a journal that holds them. At the very least, a Chapter summary, applied to BOTH the SE & CE versions as a way to review the tale + want to actually play to the end to see what happens. If you liked this game you might want to try these—I thought these were similar here at BFG: 1. Phantasmat #4- The Dread of Oakville is the scariest of this series (later in the game), and also perfect for a scare at Halloween. I’ve added a link. 2. Fright CE (also a great game to play at Halloween with live actors). It’s an older game but it does have a jump map and a favorite of mine to this day. You also play in a corn field. 3. Bonfire Stories: The Faceless gravedigger (has a similar in game feel) 4. Sable Maze #7 Nightmare Shadows 2017, and its predecessor, Sable Maze #1 Sullivan River (older game, with no maps, slow hint) also starts out with kids at a camp. If you want to see more details what CE bonus content unlocks, and bonus play- I’ve listed that info. under that game page. Thanks to BFG, and Eipix, you should be so proud of yourselves! The great graphics and use of live actors mixed in; makes for a really fun game. These are the best rendering of “ghosts” I have ever seen in casual gaming. Great job. Rated 5 out of 5 by Yanie1020 from Had to Give it 5 I really liked everything about this game, but the puzzles were the best. They weren't all easy, which I appreciate. Atmosphere, music, & graphics were excellent. Could have been longer but wasn't extremely short like some. I'm not following the players who rated this game low. Rated 5 out of 5 by zeldaqn from challenging I don't understand the low ratings on this game. I am a puzzle person and the puzzles, from the get go, were quite challenging. This game deserves at least 4 stars. It has that creepy factor and the storyline is refreshingly different. The hops are different and a nice change as well. Rated 5 out of 5 by Ruckus777 from Creepy Cool! Personally, I really enjoyed this game. From the get go, the art was beautiful, and the title screen already prepared me for a spooky game. The sound effects throughout were so similar to an actual horror movie! The game does a fantastic job building its atmosphere. Its characters onscreen move so lifelike! Though I think the game (albeit on easy mode) could be a bit more difficult, I liked the unique aspects of the game, such as a clown nose being the key to a child's door lock. The HOPs were unique, as well, such as finding the parts to and fixing a child's toys. The storyline, at least from the demo, didn't seem to be anything out of the ordinary, but I still enjoyed how it was implemented in the game. Definitely interested in finding out what happens next! Overall, I really liked this game. Rated 5 out of 5 by greenshade from Completed Game + Bonus CE I was able to purchase the CE at SE prices and am glad I did. I felt like this was the first Phantasmat by Eipix where I felt like I was playing a Phantasmat game. Great spooky atmosphere and intriguing story line.. (the ghosts appeared as though they were actual people ?? I loved that.. real people makes the game more real for me) Nobody does silhoutte progressive HOs like Epix. I usually breeze through them but often have to use at least one hint to progress. Especially loved the one in the boys room. Puzzles.. hate them anyway but was able to do a few. More than a few steps (in guide) and I opt to skip. Knowing that the bonus chapter has been criticized, I wasn't expecting much and that's what I got. I was especially interested to see what was in the extras, however. Pleased to see match 3 until I realized it was just an endless loop with no end. (I like some satisfaction of completing a level !!) I still miss journals from most developers but especially miss "the making of" in the extras where we get to meet the gang who worked on the game. One more thing... this game was high on my creep factor.. as all Phantasmat games should be. Please, Eipix, be consistent! The next game should not be a step backward! Rated 3 out of 5 by pennmom36 from MY PSYCHO "HUSBAND" WAS MIA FOR MOST OF THE DEMO Okay, I'm deducting 2 stars for Insidious Dreams from my CE review because I was totally disappointed with the storyline after the demo! The thing that made the demo exciting was the fact that I was trapped in a ghost filled house with a crazed lunatic, and no memory I might add. Well kiss all that goodbye, because after the demo, he rarely makes an appearance, and I no longer feel that sense of urgency, I get a brief glimpse now and then, but I may as well be saying "hey Stan, how,s it going, anything I can help you with?" After the demo, the storyline just isn't anything to write home to Stan's mom about, it's not a bad storyline, but man I was hoping this game was going to be exciting :( Here's a recap of my review to help you decide which version, if either is right for you, but keep in mind that most of the excitement happens in the demo: It's no secret that this is my favorite series of all time, and that the original Phantasmat game is my all time favorite HOPA game. There has never been a game that has a better storyline, or more entertaining. The reason the original Phantasmat is so good in my opinion is that it was produced by Codeminion. Phantasmat games are not about life or death per se, they are about whether or not you are alive or dead, or just somewhere in between the phantasmal realm of reality. In Insidious Dreams, Ashley probably wishes she were dead, after a car accident that leaves her with a severe concussion and amnesia. Is her mind playing tricks on her, or does this old farmhouse really have otherworldly residents? Ashley tries to fit the missing pieces of the past together, but whose past is it? More importantly, what's in her future? 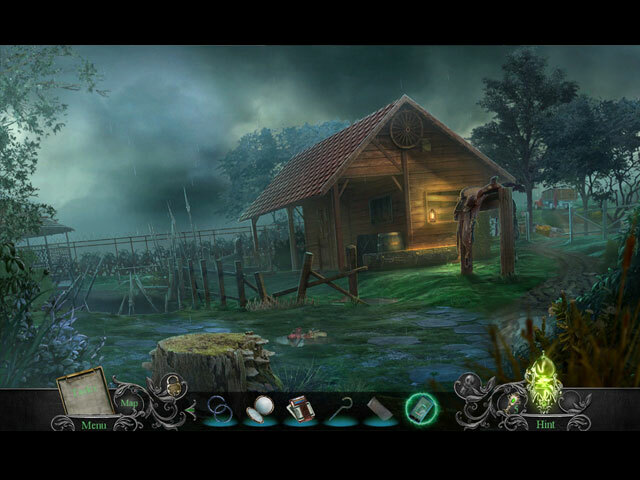 This isn't one of the best Phantasmat games in the series, but I love the creepy, psychotic vibe, of not knowing who to trust, similar to The Town of Lost Hope. In the Collector's Edition, there are 35 collectible creepy Dolls (should have been clowns) and there are Morphing Objects within 9 of the Hidden Object Scenes (you know how I feel about morphs only being in the HOP's!) 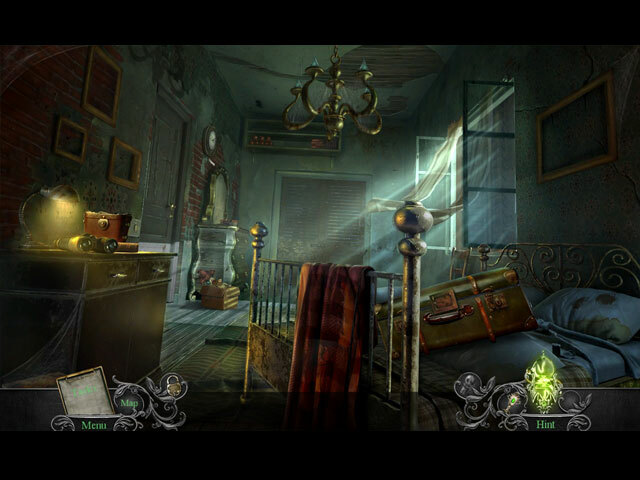 The Hidden Object Scenes are really lengthy and somewhat entertaining, something I rarely say about HOP's nowadays. Most offer two types per HOP with Progressive Interactive Silhouetted Shape finds, Interactive List finds, and Multiple Object finds, some even have smaller Zoom Zone HOP's within the main HOP. As I said earlier, the CE version has a Morphing Object within 9 of the main HOP scenes, a feature I'm never thrilled about in the first place, and why only 9? There is an optional Match 3 game to play if you're not into hidden object finds. The Mini Games are decent as well, they aren't really difficult, but some of them are difficult to complete on the first attempt. Below are brief descriptions of the games you'll encounter during the demo: 1-Place sliders on the corresponding disks by selecting buttons to rotate the sliders around the board. Select the slider when it's at the beginning of the inside rail to move it to the disk at the end of the rail. 2-Use directional arrows to move the slider to pick up 2 tokens at a time and place them on their corresponding slots, by retracing tangled wires. 3-Select left and right flippers in a game of pinball. 4-Remove all but one sphere by jumping spheres to remove them. 5-Place the padlock pins into the four center spaces using directional arrows to move the chains in the direction indicated. PHANTASMAT GAMES AVAILABLE Title Collector's Edition Release Date Average Rating 1-Phantasmat (February 8-2011) 4.5 2-Crucible Peak (December 6-2012) 3.8 3-The Endless Night (January 10-15) 4.0 4-The Dread of Oakville (July 9-15) 4.2 5-Behind The Mask (December 17-15) 4.4 6-Town of Lost Hope (April 7-16) 3.5 7-Reign of Shadows (October 6-16) 4.3 8-Mournful Loche (April 13-17) 3.7 9-Insidious Dreams (September 14-17) 3.7 The Collector's Edition version has 8 Wallpapers, 8 Concept Art pictures, 8 replayable Movie Videos, 9 Music Soundtracks, 12 replayable Puzzles, Alternate Hidden Object Scenes, a Souvenir Room, 35 hidden Dolls, 9 Morphing Objects within the Hidden Object Scenes, a built in Strategy Guide and a Bonus Chapter, enjoy! Rated 2 out of 5 by Granny_Gruff from Gone Are The Days... TThe first game in the Phantasmat series had a story filled with finesse. The games and HOPs were well done and it was above and beyond anything around right then. That's NOT this game. Apparently the Devs phoned in this entry in the series, because the story is up in your face by the end of the demo and gameplay is choppy. In addition, no synopsis would make sense unless it was full of spoilers, but I'll try to keep them out: The cut scenes start with a small boy named Kevin climbing rocks as his friends watch from below. He falls. You are driving down the road. Your car is hit on the driver's side by a truck coming from a side road. You are in the hospital and wake to hear the doctor tell a man, presumably your husband, that you have amnesia and need a long rest. You are at an old dirty, decrepit farm house and your husband, Stan, is going to secure the house against a heavy storm that is moving in. Left alone, you see the ghost of a small boy in the hall. He runs into a locked room. Good Stuff: There is good artwork. Bad stuff: Most of the story is there if you care to see it - and it isn't pretty. The HOPs are full of small dark items. The mini-games are down right wicked - I'm not sure if they are as unsolvable as they seem or I'm just aging faster than I'd like to admit. Once you are finished with the demo, you will realize that this is an almost average game with no mystery as to what's going on and where it is headed. You REALLY need to try the Demo before you consider buying. Rated 2 out of 5 by biscuitsmama from KEVIN WILL HAVE TO GO IT ALONE ON THIS ONE AS I AM OUT OF HERE Let me start by saying that Phantasmat has never been anywhere close to being my favorite series. After the last Phantasmat game - Mournful Loch, I swore that I would never buy another game in the Phantasmat series. Well here we are it’s another day and for some odd reason I just had to indulge my addiction to purchasing CE games. What a mistake, particularly when I should have known better and shackled myself far from my laptop and that “buy” button. In the game’s opening video we see a young boy named Kevin being urged by his friends to scale a mountainside and then when they realize he is in danger, they tell him he has gone too far and that he should climb down. Well with the series name being Phantasmat it doesn’t take a genius to know that the boy will slip and fall; and with that we have the beginning of another game in the Phantasmat series. You play the game as Ashley White (or do you?) who has suffered a severe concussion in a traffic accident and now must recover from a bad case of amnesia. The doctor tells your husband Stan that you must have a quiet environment in which to recover so he takes you to his farm in the country. I guess with a bad case of amnesia you didn’t happen to notice the rain stained pillows or the decaying environment. I doubt I could relax in a dirty and rusty bed but hey anything is possible in game land. At any rate, it isn’t long after you arrive for your relaxing recovery (and yes there is a raging storm approaching just to add to the ambience and make matters a bit worse) when Stan informs you that you must first secure the windows from the storm before going to bed – yep in that filthy bed no less – even though he realizes you are injured and tired. As you are securing the windows you happen to see the reflection of a young boy who seems to beckon you and you have an urge to follow him. Kevin (yes the very same boy who fell from the cliff) leaves some clues and help for you as you find your way through the decaying farmhouse. As we learn bits and pieces of the story we begin to see that loving Stan definitely has another side to his dark personality. So the question for me is do I really want to suffer through the tedium of the game in order to find out more about Stan and our relationship. In my case the answer is no but that is just me. Where the game falls apart for me is with the HOP scenes that are simply dreadful. There is a progressive scene early in the game where I had to use the hint button several times to simply get started. The scene made no sense and the items were ridiculously difficult to find. I know there has been a huge outcry from some gamers who want more difficult and challenging games but I am not one of them. However, I guess this developer has heard that call because their last several games have been so tedious and boring that I doubt I will ever purchase another. I remember when the Eipix name once equated to awesome, gorgeous, and wonderful games. I found the gameplay to be fun, if not challenging, with HOPS that were creative and where I could actually identify the items to be found. Recently this developer has resorted to using unidentifiable blotches, parts shrouded in glaring light or hidden behind dusty webs, or worse yet – items that are so infinitesimally small it would take a magnifying glass to find them. That is not what I want in a HOPA game. Part of the enjoyment for me is a relaxing search for items that can be found without too much effort. That does not mean that I don’t want some challenge or creativity in the scenes because I certainly do. I just don’t want tedium and frustration when I play since I don’t find that fun. If this game has any redeeming qualities they turn out to be some excellent mini-games that I actually enjoyed. Unfortunately, the game is so bad that not even the excellent puzzles could get me to stick it out past the game’s demo. Unfortunately I purchased the game without trying the demo and that was a huge mistake. This is a game that will sit in my purchase history without ever being played. Well maybe one day when I want a dose of punishment I might decide to suffer through the game which might not take too long since the game appears to be very short with only 12 HOPS and 13 min-games and a very short strategy guide. Even though this game was not my cup of tea, I am sure that many out there in Big Fish game land will find the game to be just what they are looking for. As always, please try the demo because you might just be one of those gamers who love the game. Happy gaming! Rated 1 out of 5 by roaming from I Wasted a Coupon This game is so far from the genius of the original Phantasmat, and that's a shame. 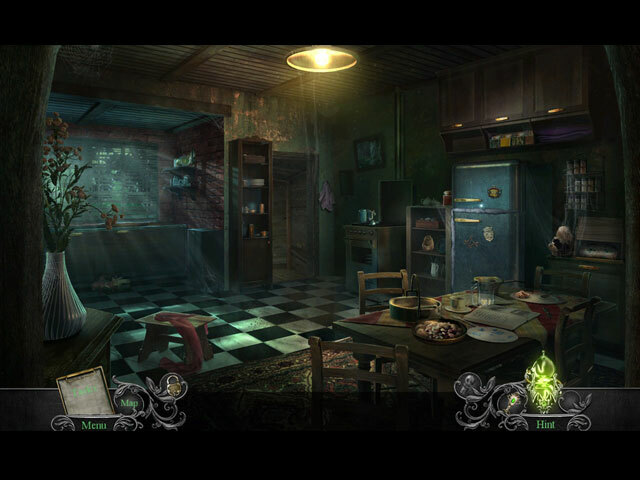 The reason I got it was because some reviewers said it was more like the first couple of Phantasmat games. It wasn't. And sorry, but I beg to differ with some who thought it was spooky. IMO, the spookiest thing in this game was the clown toy sitting on the stair banister. The rest was just old, grungy, and dilapidated... graphics up to par otherwise, except for the demons, which were more like cardboard Halloween decorations and not at all scary. I was so bored that I nearly gave up and quit the game several times. It really was like a smorgasbord of cliches from every HOPA of the last ten years. Sadly, it wasn't worth the effort of continuing. The end of the story was a real letdown... sudden and utterly predictable.